Love the outdoors? Then you'll love this bookcase from the Boone Mountain collection. Inspired by hand hewn log furniture, it will have you feeling woodsy. It features three fixed shelves for your favorite books or to display your family camping photos. Finished on all sides in Craftsman Oak, this piece is a versatile fit for your living room, office, bedroom or anywhere else. Stack it, store it, and display it with this 3-shelf bookcase from the Camden Country collection. It features two adjustable shelves that are perfect for storing and displaying books, bins, plants and other home dicor. Finished in Planked Cherry, this versatile bookcase with decorative moldings and sturdy 1" thick construction adds style and functionality to any room in your home. Axess 3-Shelf Bookcase, Pure White Ideal for your binders, books or decorative items, this versatile 3-shelf bookcase can meet all of your storage needs. Both functional and attractive with its sleek contemporary styling, this bookcase is sure to enhance the look of any room in your home. 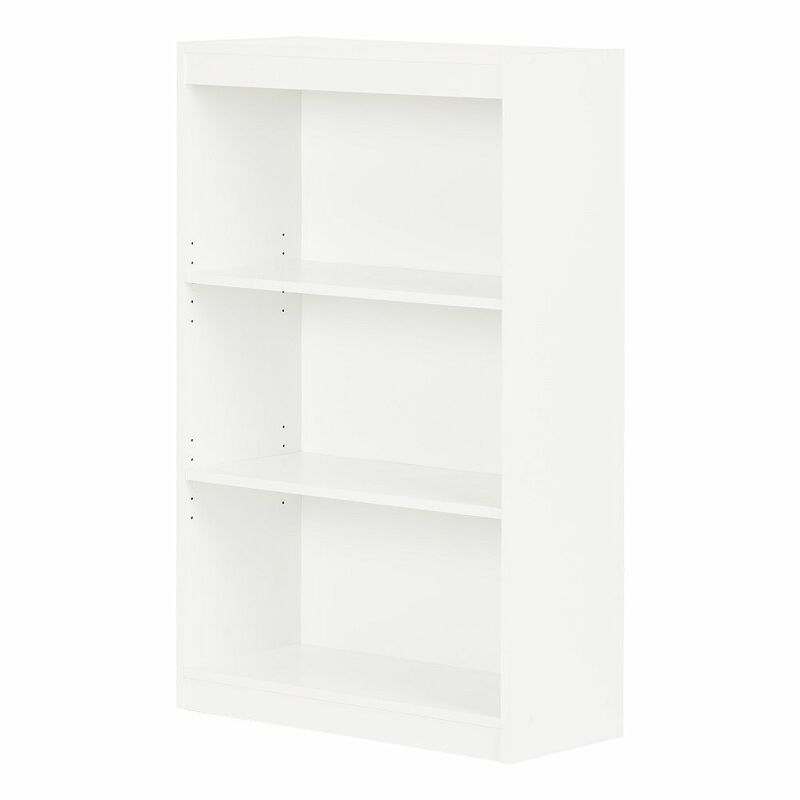 Axess 3-Shelf Bookcase, Pure White is rated 4.1 out of 5 by 36. Rated 4 out of 5 by Brenbro from Nice looking bookcase Bookcase easy to put together for the most part. Given extra parts which was nice. Once put together it looks sharp. Pleased with my purchase. Rated 5 out of 5 by Jack from Great Shelves Very sturdy and easy to assemble. Material looks durable. Rated 4 out of 5 by DIY from 3 shelf 4 shelf and 5 shelf bookcases We purchased 6 bookcases all together (2 of each size) for our basement makeover. They were not difficult to assemble, but it does take time and patience to assemble them. We are very happy with the look they created, and have allowed for us to display not only books, but also photos, and other decorative items. They work great in our new found family room for a family of 6. The price was extremely reasonable, and the free shipping took less than a week. The price and reviews are what sold me on this product. Now that we own them, I would purchase again for the same situation. Rated 3 out of 5 by KrysiaK from You get what you pay for. Regular bookshelf. Looks as on picture. Easy to put together. Rated 5 out of 5 by TRex from Solid! After shopping WalMart and others, found what I believe to be both these best value and certainly the best built product available within this price range. Rated 5 out of 5 by 12345 from Three Shelf White Bookcase The bookcase was easy to assemble. The quality of the materials were very good, even though they were made from particle board. All assembly materials were of very good quality. Everything fit just perfectly. We were very pleased with how well it was made in the USA. thanks! Rated 4 out of 5 by efreede from Nice Looking Functional Bookcase The bookcase was fairly easy to assemble. Took about 1 hour. Once finished it looks very nice and so far has stood up well to heavy books. Looks nice in our office. Quality is excellent.